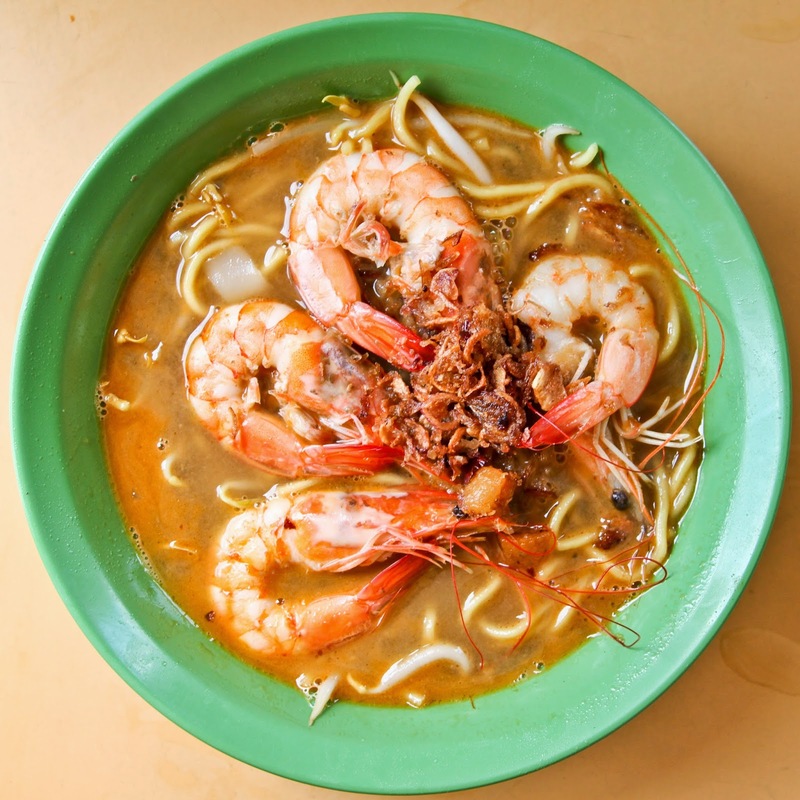 We have all heard of those giant king prawns being the best prawns for Prawn Noodle soup. However, River South (Hoe Nam) Prawn Noodles does the exact opposite. They serve up medium sized, fresh and crunchy prawns! This is probably the only place where you can have prawn noodles in 24 different ways. Pair your prawn noodles with pork ribs, pig's tails, intestines, abalone clams and baby abalone. 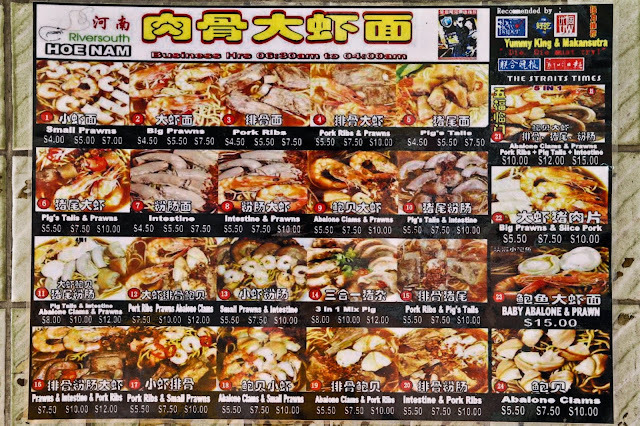 Let's be honest, the menu here may seem overwhelming and you only have one stomach. So what should you go for? Order anything you like, as the secret to this store is all about the soup. The soup is made from pork bones and prawns which are cooked overnight. 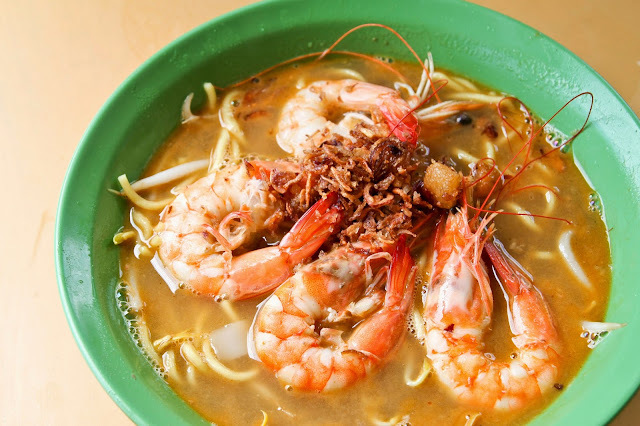 The result is a extremely savoury, thick and fragrant prawn noodle soup. 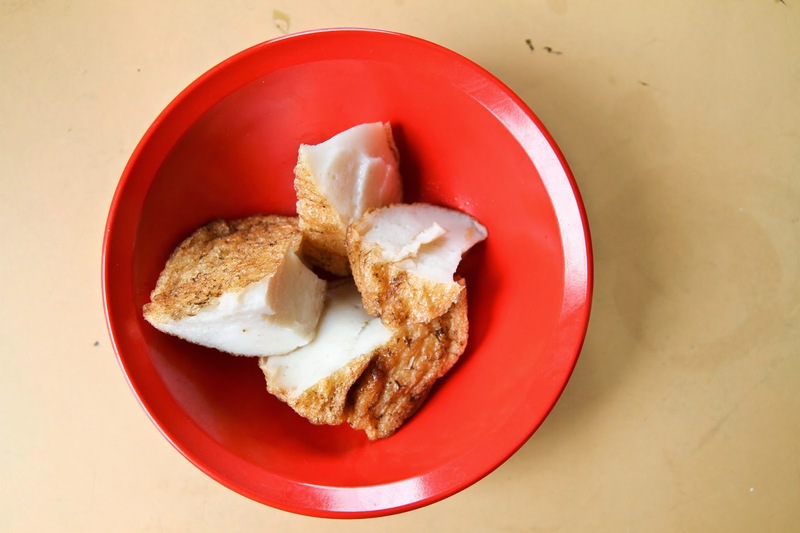 The soup gets its sweetness from the prawns and its richness from the pork bones. Some people prefer the prawn noodle soup at night as it gets thicker. You be the judge! This store opens close to 24 hours a day (6.30am to 4.30am) and owns the entire coffee shop. 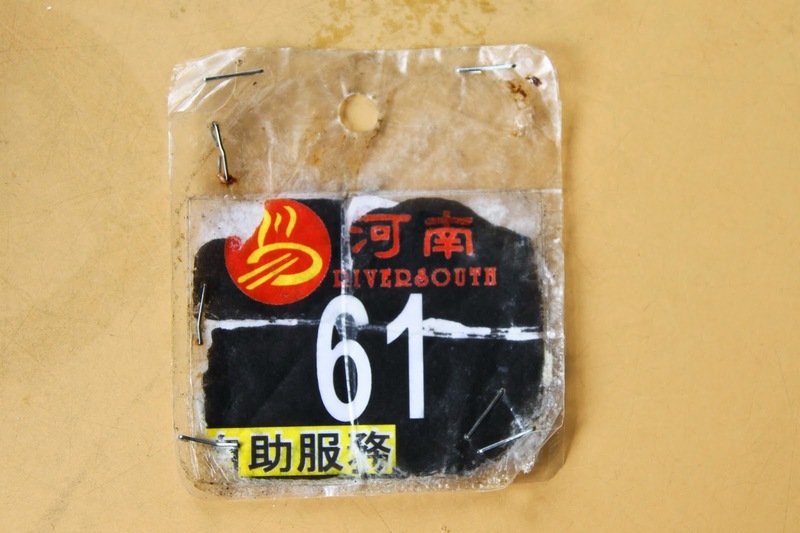 You will be given a queue number and will be called up on a electronic display or the constant yelling of the store owners when you missed your number. 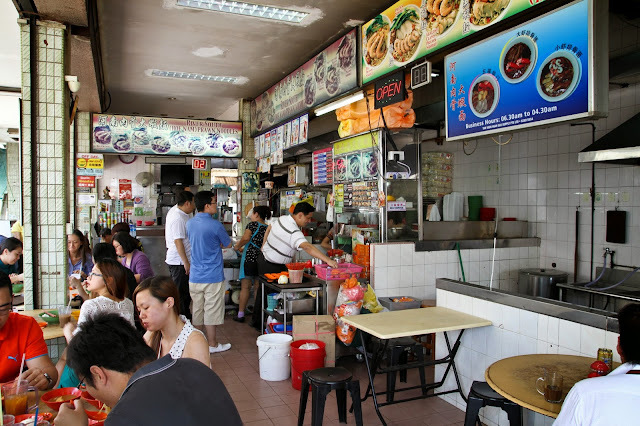 But they store owners are friendly and just want everyone to get their noodles as soon as they cook it! The prawns are peeled, leaving the heads and tails on. The soup is robust, full of flavour. Unfortunately, there is no refills for soup. Have you ever asked youself the difference between the two crustaceans? They seem like they are extremely easy to tell apart as compared to a crayfish and a lobster. Prawns and shrimps are both decapod crustaceans (exoskeletons and 10 legs) and found in both salt water and fresh water. They do not seem to have differences in taste and their names are loosely used around the world. However, they do have differences and can be identified easily. To be certain of the identity of a crustaceans, look at the abdominal and leg structure. 1. Prawns' 2nd abdominal segment overlaps only the third abdominal segment while shrimps' 2nd abdominal segments overlaps the 1st and second abdominal segments. 2. Prawns usually have claws on three out of five pairs of claw-like legs (Pereiopods) while shrimps have claws on two out of five pairs of claw-like legs (Pereiopods). There are other ways to tell them apart such as Pincers and Gill Structures but they are normally removed or difficult to tell apart. Take a look at the info-graph below to find out what are pereiopods. 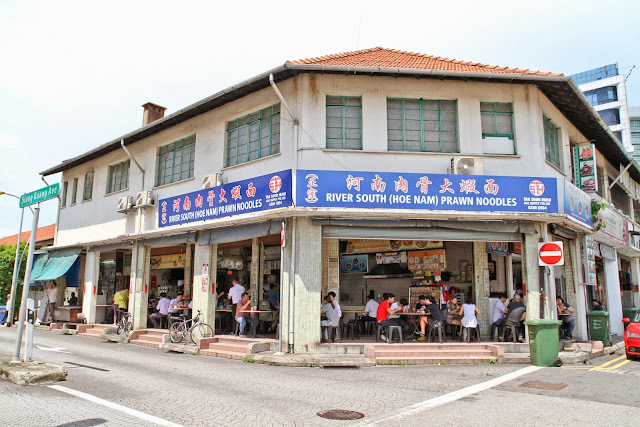 - The prawns served at River South Prawn Noodles are medium sized. Not your giant king prawns! But they are excellent! - Come early for lunch, before 1pm on weekdays to avoid disappointment as their pork ribs sell out fast. Better still, arrive around 11am to avoid the lunch crowd. - After 3pm, the night store opens and the bowls change colour too! The pork ribs will be available for the night. - If you can't decide between dry or soup. Order the soup.